Of Life and Loss: The Polish Photographs of Roman Vishniac and Jeffrey Gusky is organized by the Santa Barbara Museum of Art and features 45 photographs by Roman Vishniac, made in Poland’s Jewish communities in the mid-1930s, and an equal number of images by Jeffery Gusky, taken six decades later in many of the same areas. 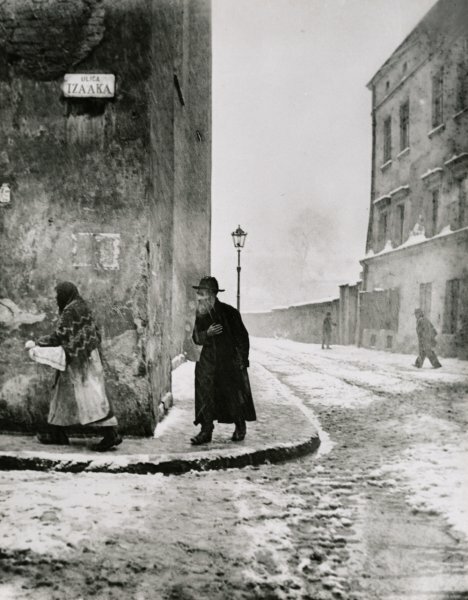 Roman Vishniac, a Russian-born Jew, photographed some of the Jewish communities of Central and Eastern Europe before the conflagration of the 1930s and 40. Prompted by a commission of the American Joint Distribution Committee, Vishniac took over 16,000 photographs (2,000 of which survived the war) over a three-year period. His poignant works feature vibrant communities filled with life: men, women and children in their homes and schools, at their trades and in their streets, markets, and temples. Six decades later, Jeffrey Gusky, a fine art photographer and rural emergency physician from Texas, traveled to Poland to photograph the ruins of these long-destroyed communities. Gusky’s photographs were motivated by his personal feelings of horror, experienced five years before 9/11 while traveling in Poland, that mass destruction could happen again in modern times. Examining each photographer separately, Vishniac and Gusky have very distinctive photographic styles. Due to the nature of his project and the ever-escalating semblance of anti-semitism, Vishniac’s photographs are less polished and more emotionally raw in an attempt to tell the stories of people’s individual lives. By contrast, Gusky finds inspiration in the physical places which made up the world of now entirely absent communities of Jews. There are also several points of convergence in the biographies of Vishniac and Gusky. Like Vishniac, Gusky is of Russian Jewish descent, and both men were compelled to their photographic projects in part by personal reasons springing from their Jewish heritage. The photographers also have professional ties to biological science which embody their work through illustration of the fragility of human life. Born in Russia, Roman Vishniac lived in Berlin with his family during the 1930s. As Hitler’s rhetoric more aggressively targeted the Jewish population of Germany and broader Eastern Europe, Vishniac picked up his camera and traveled across the region photographing a spectrum of human life in Jewish shtetlach (towns) and the ghettos, including oppressed Jewish children cautiously at play, laborers without work, and elderly lacking adequate care. Vishniac was a scientist who used microphotographic techniques in his research studies. Surrounded by the vibrant artistic culture of Berlin, Vishniac did not experiment with the aesthetic techniques of current European photography. Instead, he captured the individual humanity of the Jewish communities between 1935 and 1939. In the late 1990s, Jeffrey Gusky traveled to Eastern Europe in an effort to make sense of his personal Jewish identity. Gusky captured the melancholic beauty of the austere landscapes of former Jewish communities on four journeys through Poland. In his first attempt at fine art photography, Gusky produced haunting black and white photographs of architectural remains, places that have been silenced for over fifty years. Gusky was inspired to his project by American cultural representations of the persecution of Jews under the German Nazi regime, such as the film Schindler’s List; however, his photographs differ in scope and effect from contemporary cinematic efforts to increase knowledge about the fate of Eastern European Jews. Instead, Gusky’s cold, desolate images evoke feelings of mystery accompanied by the finality of the loss.